1 – Soak the gelatine leaves in cold water until soft. Boil the cream with the vanilla pod and the sugar. Let infuse and cool down for 10 min. Take the vanilla pod out. 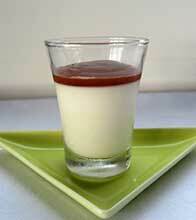 2 – Squeeze the gelatine leaves and add to the warm cream (it must be warm but not boiling). Stir until the gelatine has completely melted. Then add the coconut milk. 3 – Divide into 6 small glasses or cups. Let set in the fridge for 5 hours at least. 4 – In a small pan, make a caramel with the sugar and a little water. When the caramel takes a nice brown colour, add the butter, stir to melt it then add the single cream. You get a thick sauce. Top the pana cotta with the sauce. You may choose to serve the sweet immediately or prefer to put it back in the fridge to serve cold. The vanilla can be replaced by a tsp of grated lime.